We met at ‘The Creamery’ in Grange, Co. Waterford at 7.15am – all 8 of us! The forecast was for clear skies until mid-day. Alas, the forecast wasn’t right and the morning quickly deteriorated with a heavy fog / mist rolling in. We turned right at Fleming's Pub, taking the small roads through ‘Old Parish’ on towards ‘An Gaeltacht’ in Ring. We turned off towards Mine Head Light House and parked in the farmer’s yard. The Light House access is through the farmyard and is usually padlocked. Today, however, we had obtained kind permission of the farmer in advance of our expedition. We walked the 900mtrs to the coast using the farm pathway. George Halpin Senior designed the major light of Mine Head. The red sandstone structure sitting on top of the steep cliffs of Old Parish is higher above sea-level (88m, 290ft.) than any other Irish lighthouse. Local merchants and mariners from Youghal and Cork pressured the Ballast Board to begin a lighthouse tower on Capel Island off Youghal. This building was begun even though George Halpin felt the best place for a light was on Mine Head. The work was well under way when the local people changed their mind and decided that the light should be at Mine Head after all. After much debate, including input from Trinity House and the Admiralty, it was decided to abandon the site on Capel Island and build on Mine Head. The light was established on 1 June 1851, the same day as Ballycotton lighthouse. Mine Head has a 22m (72ft.) white tower with a black band. It was converted to electricity in Sept. 1964. Today, however, the light is no more than a good household torch. As the fog got worse, we could hardly see 80 mtrs ahead so, we took a few shots and put this trip down as a recognisance trip as we could well imagine the beauty of this spot on a fine morning as the sun rises! We had planned to breakfast in Dungarvan by the quays, where we could get nice shots and then go on to Mahon Falls, but decided to call it a day. We’ll do it again sometime and better luck next time. Mouse over the image below to activate the slide show. Enjoy! 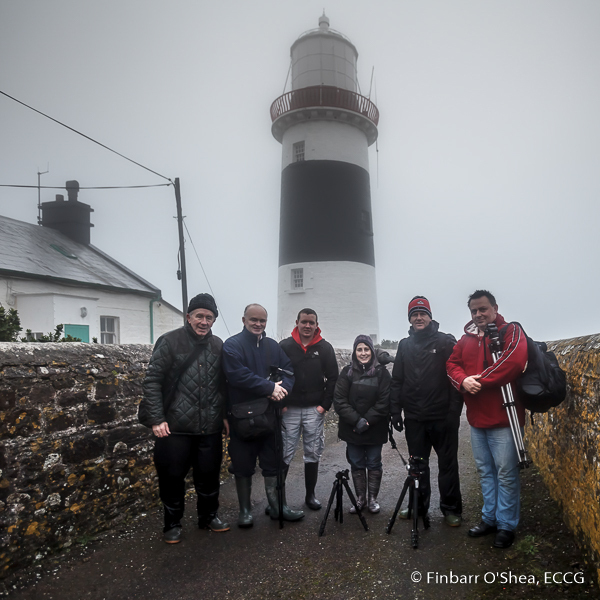 This entry was posted in Shoots and tagged Lighthouse, Mine Head by Denis Barry. Bookmark the permalink.